Reckoned as the destination abounded with heritage forts and magnificent palaces, Rajasthan is the heart of the India and its history. At India Reisebuero Pvt. Ltd., we are organizing memorable Rajasthan Heritage tours for the tourists who wish to delve into the depths of the Indian culture as it was during the reign of the Maharajas. With us, you will get luxury Rajasthan heritage tour packages in India. Exploring the land of Maharajas with your loved ones would be an amazing and unforgettable experience. Be it the camel safari or the traditional puppet show, Rajasthani culture will engulf you. 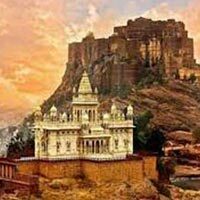 So, enhance your vacation with a touch of Indian history by planning a Rajasthan heritage tour. Upon arrival at Delhi Airport our representative will greet you. Then you will be taken to Jaipur in Rajasthan by car. En route enjoy elephant ride ascend to Amber Fort situated atop a hill in the outskirts of Jaipur, the Pink City of India. On arrival in Jaipur, check-in at the hotel. Relax. In the evening explore local colorful bazaars. Dinner and overnight stay will be at the hotel. Have breakfast at the hotel. Proceed for sightseeing tour covering major places like City Palace, Hawa Mahal, Jantar Mantar and Birla Temple. Later, drive to Pushkar en route visiting Ajmer Sharif Dargah. Continue to Pushkar. Visit the Lord Brahma Temple and the Pushkar Lake in Pushkar. Dinner and overnight stay will be at the hotel in Pushkar. After breakfast drive to Udaipur –the City of Lakes & Palaces, one of the best and most romantic cities in Rajasthan and India. Later proceed for city tour covering places like City Palace, Lake Palace, Jagdish Temple, Lake Pichola and Saheliyon-Ki-Bari. Dinner and overnight stay will be at the hotel. After breakfast drive to Mount Abu –the only hill station of Rajasthan. Upon arrival, check into hotel. Later visit the magnificent Dilwara Jain Temples built in 11th century, Sunset point and Nakki Lake. Dinner and overnight stay will be at the hotel. After breakfast depart to Jodhpur, the second largest city of Rajasthan. 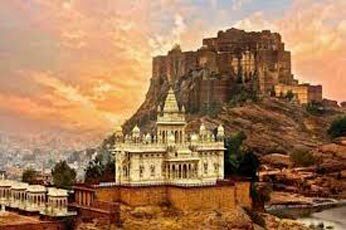 Visit Mehrangarh Fort, Umaid Bhawan Palace, Museum, Jaswant Thada Memorial and Clock Tower. Dinner and overnight stay will be at the hotel. Have a relaxed breakfast at the hotel. Later drive to Jaipur, the capital city of Rajasthan. On arrival in Jaipur, check in at the hotel. Spend rest of the day at relaxation. Dinner and overnight stay will be at the hotel. Have a relaxed breakfast at the hotel. Drive back to Delhi. Our representative will help you transfer you to New Delhi International Airport to board the flight for onward destination.